There is a long tradition in American foreign policy of doing the right thing but doing it late. This is an understandable phenomenon: Democracies by their very nature move cautiously, and, for any number of reasons, this is often a good thing. But America is also the most powerful country in the world, and so our labored pace can be maddening to those who look in our direction for help, or at least for moral support. To take one example, our slowness was catastrophic for the people of Bosnia, whom we rescued—but not quickly enough. And this tradition does not only apply to military examples. It also applies to diplomatic ones, especially where human rights are concerned. In 2009, President Obama waited far too long before speaking out on behalf of the people of Iran as they rose up against the regime in Tehran. Our approach to dealing with the Libyan rebels fits into this tradition. We did deploy force to rescue them and prevent a massacre in Benghazi, although acting earlier might have increased the odds of success. But then came an inexplicable delay from the Obama administration: For months, we sought to topple the Qaddafi regime but refused to recognize the rebels as the legitimate government of the country. It was not as if we did not know who the rebels were. Reports about the decent and orderly society that is taking shape in Benghazi, the rebel capital, should have told us much of what we needed to know about these opposition leaders. Two months ago, The New Republic ran a persuasive piece by Tom Malinowski of Human Rights Watch detailing his experiences among the rebels in eastern Libya; but he was hardly the only observer to conclude that they were a largely admirable group. Everything we have learned about these dissidents should have suggested that they were worthy of our support—and that the sooner the most powerful country in the world recognized their legitimacy, the better. Yet, for some reason, the Obama administration could not bring itself to acknowledge the rebels as Libya’s government. Instead, we used absurd language, calling them “the legitimate and credible interlocutor for the Libyan people.” When we finally recognized them two weeks ago, more than 20 other countries had already done so. It is worth recounting this recent history, as we face other unfolding human rights calamities around the globe. The first is in Syria. 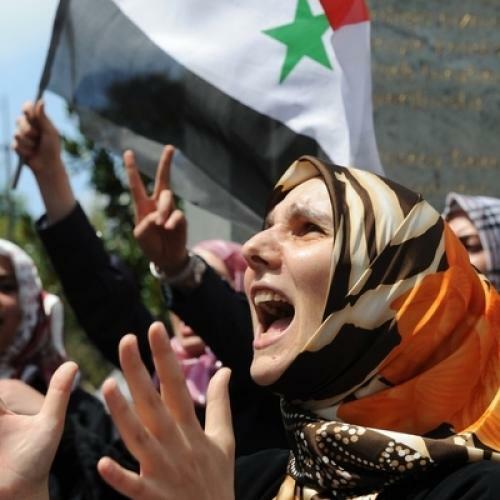 Our rhetoric toward Bashar Al Assad has been tepid. At a time when people are risking their lives to oppose Assad in the streets—and being cruelly gunned down as a result-Washington has been tempered in the public signals it has sent to the regime in Damascus. True, Hillary Clinton declared that the Assad government had “lost legitimacy.” But she later urged Syrian dissidents—who were meeting in Istanbul to form a council that could unite the opposition—to work “in peaceful cooperation with the government.” As if this were an appropriate way to speak about a government that had just slaughtered 1,800 people. Our options in Syria are limited, of course. Unlike in Libya, a military intervention is not possible; and the Syrian opposition, despite its bravery, may not yet be cohesive enough to be recognized as the country’s legitimate government. But rhetoric does matter. It cannot topple governments on its own, but it can give encouragement to people who are seeking justice against powerful odds. And so it is important that the United States place itself unequivocally on the right side of history in Syria. Obama and Clinton should be relentless in speaking out on behalf of the protesters. And they should not send mixed signals about whether we think Assad should stay in power. It is not just Syria that requires a different response from Obama. In Sudan, the government in Khartoum is once again carrying out atrocities against its own people, this time the Nuba of Southern Kordofan. In Iran, the leaders of the opposition, Mir Hussein Moussavi and Mehdi Karroubi, have been under arrest for six months. Why has Obama not focused the world’s attention on this outrage? There are times for rhetorical caution in politics, and there are times when delay can be necessary or even prudent. But there are also times for the United States to be vocal about what it believes is right.